Millions of years ago, camels roamed the North American continent. The camel family evolved here and migrated over into Africa and the Middle East as they slowly died out on this continent. One species of camel even persisted in California until only 15 thousand years ago. Today, old fossils and bones of these ancient camels are still found; as recently as October 2002 down in Long Beach. But although these camels long died out, rumors, folklore, and legends in the American South West still tell tales of wild camels and even ghost camels wandering the deserts of California, Utah, Nevada, Arizona and Texas. Some attribute these sightings to remnants of the US Camel Corps put together back in the mid 1800's. Although how the camels could survive until today or if they have been reproducing in the wild is a mystery. A few states once had laws on the books preventing the use of camels on certain highways, a result of problems occurring with camel use shortly after the closure of the US Camel Corps. Nevada, for example, passed a law in February of 1875 prohibiting camels and dromedaries from running at large on public roads in the state. The act was repealed in 1899. The US Camel Corps was a mid 19th century concept by the US Army put into motion ironically by future President of the Confederate States, Jefferson Davis. The idea was to find alternate means of transportation in the dry and rough climate of the South Western United States. To put the plan into motion $30,000 was set aside on March 3rd, 1855. Although it took awhile traveling to the Middle East, the US eventually had 34 camels (give or take one or two, reports vary, although it is interesting to note that all reports state that at least one camel was born on the trip overseas back from Egypt) arrive in Texas late April of 1856. Several handlers from the Middle East were also brought with the camels. The most famous was a Syrian named Hadji Ali, although he was called Hi Jolly. A second later shipment brought the number of US camels up to 77. The camel corps first and really only use was by Lieutenant Beale who led many of the camels across the country to California. Although Beale pronounced the camel experiment a success, many had their doubts. The camels bit, spit, and kicked their American handlers and disrupted the local livestock with their smell. After their trial run, Beale put the camels up on his friend's ranch, claiming that they should stay in California for future use if a war with the Mormons of Utah ever occurred. His friend, Samuel Bishop utilized the camels to haul freight on his own ranch and back and forth to Fort Tejon. The route taken to Fort Tejon passed through lands controlled by the Mojave Indians who often attacked civilian transports, but avoided any military soldiers. As Bishop was a civilian and the camel experiment currently officially a civilian experiment, no soldiers were with the camel caravans traveling from Bishop's ranch to Fort Tejon. A large force of Mojave Indians threatened Bishop's teamsters, forcing Bishop to order them to mount the camels and charge the attackers. The surprise charge of the teamsters on such strange beasts did in fact rout the Mojave Indians and also went down in history as probably the only camel charge in the west, which ironically was performed by civilians as opposed to the military. There are rumors of a few more experiments performed with the camels. They are attributed to the US army when it was still trying to find a use for the beasts. The first involved using the camels in an attempt to perform a pony express or "camel express". Sadly in both the first and second attempt the camel dropped dead from exhaustion. It was determined that although the camel could carry enormous loads and travel for extended periods of time with little rest, food, or water, it was not an appropriate steed for a mailman to speedily deliver the mail, especially since its maximum speed appeared to be no faster than the mules already used to deliver the mail. 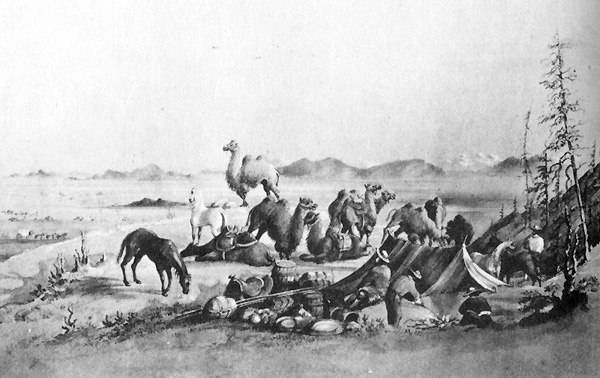 In the second experiment, the army turned the camels over to a survey crew, mapping the Nevada / California border. The expedition became lost, was forced to abandon their equipment, lost their mules, and grew hopeless of ever surviving to see civilization. 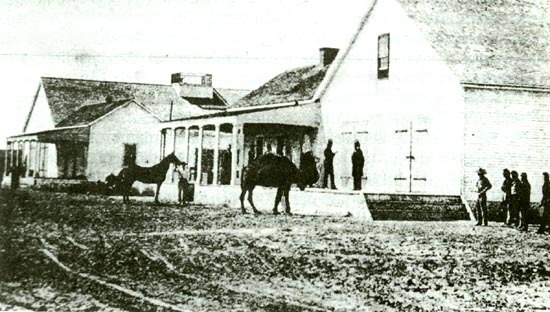 The camels took over the mission, led the crew back to Visalia, and saved the surveyors. Regardless of how well the camels did or did not perform, the coming of the Civil War pretty much put an end to the camel experiment and doomed the US Camel Corps. Although it is interesting to note, that at least the Confederate side, and maybe even the Union side, captured camels from the other during the war. Also, it is rumored that as the Civil War was breaking out, the Secretary of War was urging Congress to allow the purchase of 1000 more camels for use in the American Southwest. Despite their successes or lack their of, and the backing of people such as the Secretary of War, the Civil War and the laying of more railroads that followed killed the U.S. Camel Corps. The California camels traveled from Fort Tejon to the Los Angeles Quartermaster Office and finally to Benecia. By November 1863, the California Camels were put up for sale and purchased largely by zoos, circuses, and mining operations with a few camels going to private individuals such as Beale himself. Those camels remaining in Texas were sold off in 1865, though the government later reclaimed some of them as stolen property and then promptly released them into the desert on their own. Many of the mining operations often later released the camels into the wild when they either served no further need for them or grew tired of the camels biting, kicking, and spitting at their owners. These released camels wandered the deserts with confirmed sightings until the early 1900s. Although to this day, several people still claim the camels survive in remote areas of the US Southwest. The most interesting story about the camels is that of the Red Ghost. Depending on who you talk to, the legend goes something like this. A young recruit in the army was having difficulty learning how to ride the camels. To teach him a lesson and to get him to no longer be afraid of the camels, they tossed him on top of one and lashed him to the beast. Then they smacked the camel and began chasing after it as it dashed off in fright. The camel, later dubbed the Red Ghost, easily out paced the other camels and riders, escaping into the desert with the poor army soldier still helplessly tied to it, never to be seen again. One other story about the camels involves a prospector named Jake who purchased three camels from the army in San Francisco. The story goes on to state how although the camels were foul beasts that spit, kicked, and bit many of the people in the town including Jake, Jake cared for them and spoke nothing but praise about them. Eventually Jake made a big gold strike, and came into town with his camels' saddlebags over flowing with gold. Later that night, after Jake had celebrated his find at the local tavern, a man called Paul Adams followed him and murdered him. But Jake had been smart and hadn't gone back to the location of the mine. Additionally one of his camels had attacked the murderer, and had unfortunately been shot and killed as well, but not before taking a good bite out of Paul. A dark bit of cloth was found clutched in the camel's dead mouth. Paul was unable to located the missing mine, but Jake's ghost and the ghost of the camel found him. Jake and his spectral mount came riding up one night and chased Adams through town right up to the sheriff. After Paul Adams gave a confession, the ghosts of both Jake and the dead camel faded away. The Story goes on to say that Jake appeared one final time to give the location of the mine and his remaining two camels to one of his friends. The story continues in 1883, when a woman was said to be found trampled by a large beast. Bits of red fur were found at the scene. Several other sightings occurred afterwards all leaving large hoof prints, and a rancher reported that the creature had a rider. Supposedly some prospectors eventually sighted the creature and saw something fall from its back. That something was apparently a human skull. 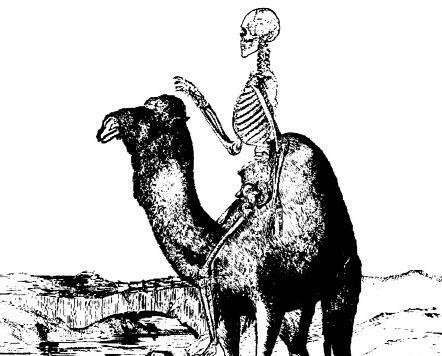 For years, the camel terrorized the countryside and eventually in 1893, the Red Ghost, now with its headless rider was killed by an Arizona farmer. The rider had long ago fallen off leaving only leather straps behind on the camel. To this day, however, every once in awhile stories of a giant red camel with a white stripe down its side (the leg bones of the corpse still strapped to it) appear. The Red Ghost has apparently gone spiritual and still haunts the deserts of the American Southwest. The Red Ghost has also been called Fantasma Colorado and according to Dennis Hauck's Haunted Places book multiple sightings have happened in the area around Clifton, Arizona, specifically around Chase Creek and Eagle Creek. The Red Ghost has also been seen in Southern California. Hi Jolly, one of the camel handlers, tried running a freighting business with some of the camels, but that sadly failed and he also eventually released his camels into the wild. 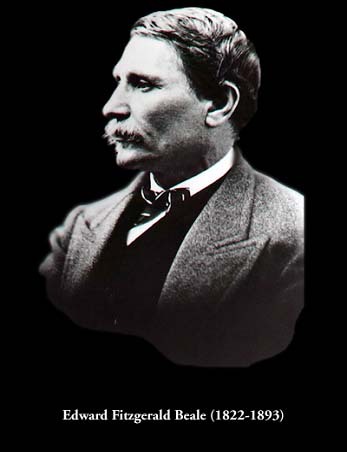 He eventually died at age 73 in December 1902 in Arizona. A pyramid shaped monument was erected for him in Quartzsite, Arizona. One account has him dying a year later chasing after the Red Ghost. This story has Hi Jolly's withered body found, arms wrapped around the neck of the corpse of the great red camel. An exhibit / museum at Fort Irwin out near Barstow discusses Hi Jolly and the Camel Corps. The exhibit features a real stuffed camel, although not one of Hi Jolly's original camels. The exhibit explains how Hi Jolly once saved five Americans from an Indian attack by charging them on his camel, cloak billowing out behind him, waving his scimitar yelling out 'Bismiallah' or "God is Great". The Indians had never seen a camel or a rider like Hi Jolly and turned and fled. Supposedly the exhibit also contains two Philippine combs that use to be dipped in poison and a Philippine Poking Device which is a human leg bone that you'd poke your enemy with. Fort Irwin handles training the U.S. military for combat with enemy nationalities. It simulates real Iraq villages to get soldiers ready for Middle Eastern urban combat. Additionally, Fort Irwin holds Goldstone. Goldstone houses multiple satellite dishes used by JPL and NASA as part of their Deep Space Network. These satellite dishes receive transmissions from many of the probes, satellites and rovers that NASA and other governments have spread across the galaxy. Topsy the Camel was rumored to have been one of the original camels brought over from the Middle East in 1856. 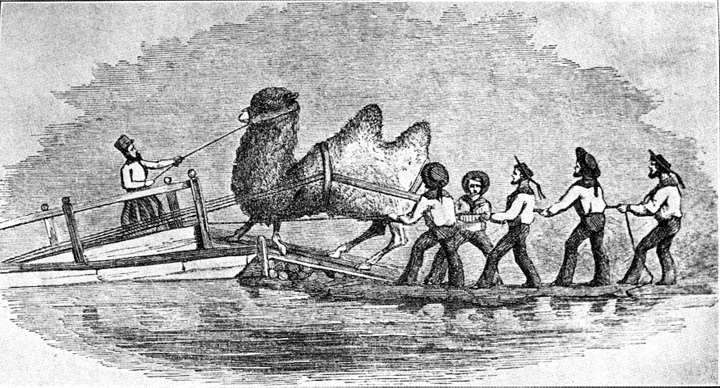 If Topsy's story is true, then after his time with the U.S. Camel Corps he ended up hauling ore (some say salt) in Arizona and later Nevada. Afterwards he became an attraction at Ringling Brothers Circus, during which he was sadly involved in a train wreck that ended up crushing both his humps. Next he went to work for Fox Studios, and when he retired from his life as an actor, he took up residence in Griffith Park Zoo or the Old LA Zoo before finally passing away in April 1934, which would have made him at least nearly eighty years old! Two other herds of camels were reportedly brought into the US around the time of the US Camel Corps. One in 1858, the other in 1859, and both I believe in Texas. Both shipments, however, were really slave ships trying to use the camel smell to cover up the odor typically associated with a slave ship. After being detained at port, both ships dumped off their camels on the docks and set sail for more slave friendly nations. The camels were pretty much left to their own devices, many either ending up shot or escaping out of town and into the wilderness beyond. Other camels were brought into San Francisco in 1860 for work in Nevada. And another shipment arrived in the state in 1862, although they were quickly resold to British Columbia. Camels do still reside in California today. In San Diego California, Oasis Camel Dairy claims to be America's first and only camel dairy. They currently make and offer six different flavors of Camel Milk Soap. Also there are occasionally Camel races at several state fairs. The bones of one of the original camels from the Camel Corps still exists at the Smithsonian Museum of Natural History. The camel, originally named Seid was killed by another camel named Tuili, but thankfully its remains were shipped back to Washington DC by a man named Sylvester Mowry where they still sit today. Today, rumors still persist that camels exist in the deserts of California, Arizona, and Nevada. Some attribute this to reclusive descendants of the original camels long ago released. Others attribute it to the ghosts of those released, silently wandering the desert in stoic lines. Are there camels still living in the deserts of the American West? Or are people just seeing their ghosts? But if you're out driving down the long lonely highways of California's deserts, and you think, out of the corner of your eye, that you've seen a camel, pause for a second, for you just might have seen one. Then again maybe it was the Red Ghost still haunting the deserts of California. Does anyone know about the camel seen in banning, ca? There is a camel at White Sands National Monument every Sunday afternoon called "Matilda." She was from Norco California. Ask any park employee and they will point her out to you. A family movie, Hawmps!, that describes pretty much all of the events you mentioned was released in 1976. I only remember it because I thought it was funny and it Hi Jolly was one of the characters. The other is that there were feral camel sightings in Colorado around Monument Lake for many years after the zoo at the lake closed. They claimed some of these camels were part of one of the original camel imports for the U.S. cavalry. Maybe people are still encountering them in Colorado. Benecia, California has annual camel races! There is a memorial and information in Quartzite CA for Hi Jolly. They also sell little stuffed Camels with info about Hi Jolly. It is really interesting. the town of merced falls has at least two camels along hwy 59 at dana slough along with assorted other creatures like water buffalo. i saw them yesterday. Yes,there were camels in Texas. I can't recall when they came there,but it was in the 1850s.There was a fort named Camp Verde, which took it's name from Verde Creek. Later a store was built to serve the fort and a little community grew up there. Not sure what happend to the camels. But the town is still there, but the buildings belonging to the fort are on private property and part of a ranch.The town of Camp verde is west of San Antonio.